Hydrangeas are truly versatile flowers – and prolific, particularly when you have several bushes in your backyard. At the moment I’ve got them coming out my ears. Just as well I have a sizable glass and ceramic vase collection. 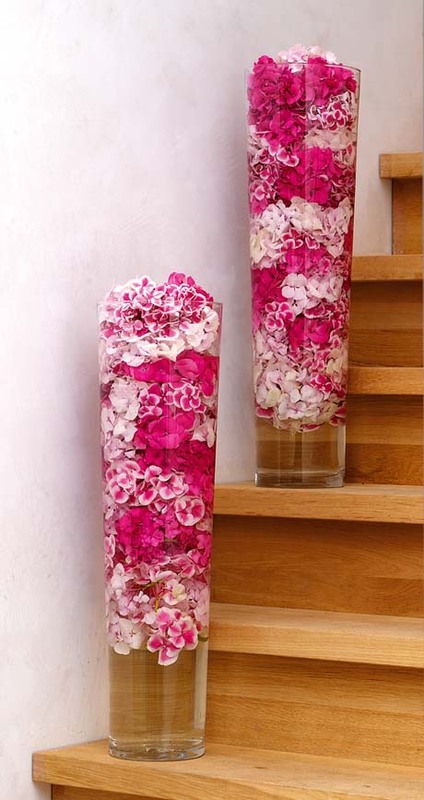 Hydrangeas, apparently, last much longer in glass vases than metal ones. I can’t say I’ve tested the theory, but that’s from the Flower Council of Holland, so it must be true. 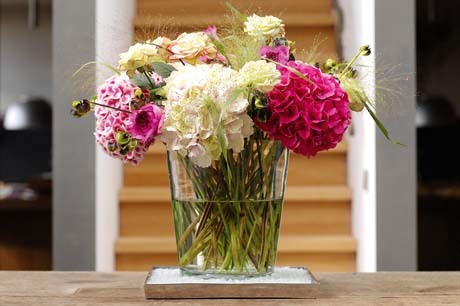 If you’re not a fan of glass vases you can cheat by putting them inside larger containers or by tying pieces of bark around the vase, as above. 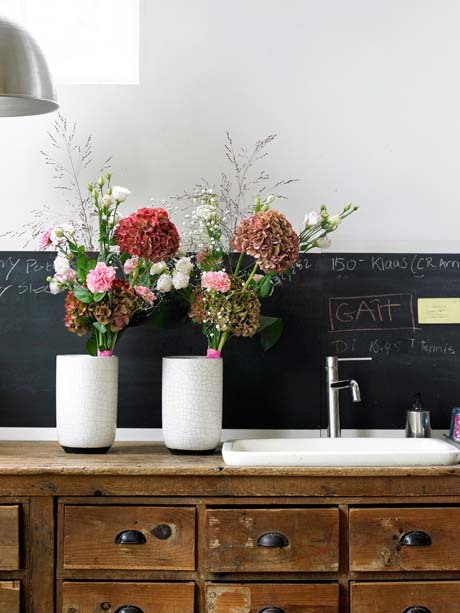 No time to whip up a fancy, multi-bloom arrangement? 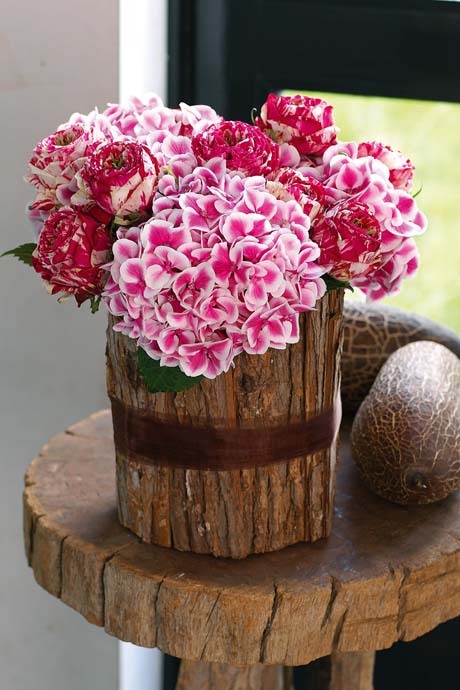 Snip off the hydrangea flower heads and place them in a tall vase of water. So simple and so chic. White hydrangeas are my absolute favourite. 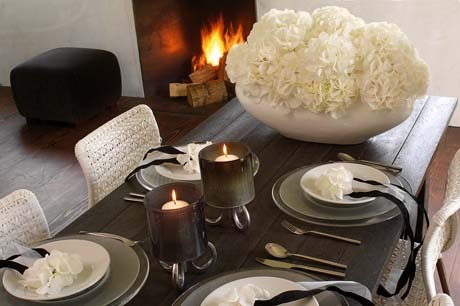 White hydrangeas in white ceramic vases. Although red hydrangeas come a very close second. 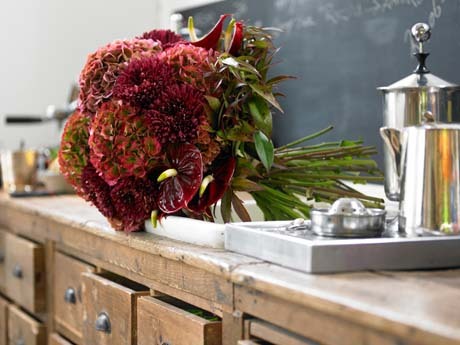 Above, red hydrangeas mix with red chrysanthemums and waxy, red anthuriums. The bottom photo shows a mix of carnations, lisianthus and baby’s breath (gypsophila). Nice. Want to know how to change the colour of your hydrangeas? Click here. Beautiful pictures of hydrangeas! I absolutely agree that hydrangeas are versatile flowers. You can use these flowers in any kind of occasion. White hydrangeas is one of my favorite too! Simple flower but absolutely pretty! Thanks for sharing these wonderful pictures! When do I prune hydrangers please? Check out the post on pruning hydrangeas here. Love the picture of your hydrangers in the tall vase, where can i purchase them? Keep up the good work. Hi Karen. Sorry, I’m in New Zealand, so I can’t help you there. 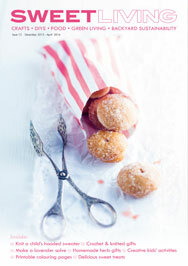 Perhaps try one of your local gift shops?